An easy option to efficiently and accurately label your produce and food products, to easily be able to tell which items to use first! By clearly labeling all products in the proper containers, you can effortlessly use the older products first, to eliminate waste! 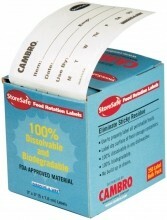 Use on Zanduco’s large variety of box, square, and round containers. Clearly marking food allows your restaurant or establishment to properly calculate inventory, to see what ingredients need to be stocked up on, or which ones to make as specials! Mark down when it was stored and when it should be used by! Not only does it help you limit waste, you can assure yourself and your customers that the food you serve is always fresh! These Rubbermaid Prosave ingredient bins feature a clear lid, for easy product identification, and will help make inventory a breeze! With capacities up to 30 gallons, you are able to store large amount of food products and ingredients in a safe and organized way.